The best thing about National Homemade Bread Day might be the way it incorporates all your senses: the sweet, roasty comfort smell that lingers in the kitchen; the sight of steam rising from the top of the loaf, the warmth in your mouth, the taste of home when you take a bite, and the seemingly automatic “Mmmmm” that comes while you chew. Get baking November 17 to celebrate and break bread with your friends and family. ​Comedian Red Skelton apparently coined this phrase during a newspaper interview. 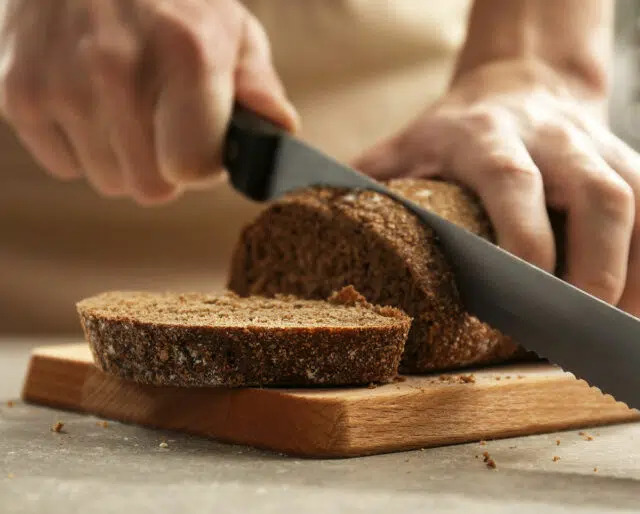 ​Otto Frederick Rohwedder invented a machine to slice bread. ​The writings of Indo-Persian poet Amir Kushrau were recorded history’s first reference to bread. ​Mount Vesuvius erupted, preserving both the Roman city of Pompeii, which had 33 bakeries, and its bakery of Modestus. ​Archaeologists found bas-reliefs, dating at least this far back, of Egyptians harvesting grain, likely for bread. Pull out a favorite family recipe or find a new favorite in a cookbook or online. And while you’re at it anyway, make more than one loaf! Whether they act as a sous chef or simply a happy taster, food is community. We’re drawn to feed those we love, and National Homemade Bread Day is all about sharing the love. Once your bread has cooled, store a loaf (or even a few slices) in a freezer bag with all the air out. Freezing your bread will let you indulge in the fruits of your National Homemade Bread Day labor long past its typical expiration date. ​Bread’s aroma comes from its ingredients, the fermentation process, and reactions during the baking process. ​Maltol, which has the scent of caramel and cotton candy, and isomaltol give bread crust its flavor and aroma. Certain compounds give breadcrumbs — and, strangely, cucumbers — their scent. ​​Scientists have used 14 molecules to mimic the smell of baguettes. By baking your own bread, you can make it as healthy — or as decadent — as you want. Opt for whole wheat, cracked-wheat, sunflower seeds, and honey — or chocolate, peanut butter, two different kinds of sugar, and heavy whipping cream. Make sure you can pronounce every ingredient you add. No azodicarbonamide (which is also used in yoga mats) in YOUR kitchen (unless you like that sort of thing). It can be tough to find bread for those with celiac disease or other gluten intolerances. Thousands of DIY recipes are out there, though, sure to make your belly — and your wallet— happy.